006. THE DISCOVERY. Issued in England by Carreras Ltd. (1929). It is card number 24 from a set of 25 cards entitled "Notable Ships Past & Present". The card was given as a free premium and was inserted into packages of 10 High Class cigarettes. 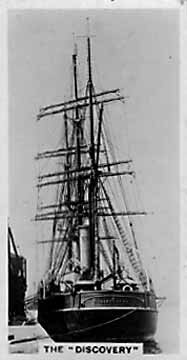 Size: 2.7" x 1.45"
Recto: Black and white photograph of the ship Discovery. The caption reads: The "Discovery"
Verso: Notable Ships | Past & Present. | A Series of 25 Real Photographs | No 24 | The "Discovery." | Capt. Scott's famous Antarctic Exploration Ship was the first vessel ever built in Britain especially for scientific research. She was built at Dundee, 1900-1, was 130 feet long, 34 feet broad, and displaced 1,620 tons. Although built of wood, she was very strong, her bows being strengthened with girders to take the strain of smashing through the ice. She was fitted with auxiliary steam engines of 500 h.p. Is still afloat, having only recently left England on a Goverment Survey Expedition to the Antarctic. CARRERAS | High-Class Cigarettes | Arcadia Works, London, England | England's Largest Independent Manufacturers of | Fire Quality Cigarettes | Established 1799? ?